Come on, O Canada!, Impress Me! Little did I know, these were Tamara's thoughts as we left Calgary, Alberta. It's been two months since my retirement ceremony. Seems like only yesterday (until I look in the mirror). People often ask me, "So, how's it feel to be retired?" I can only answer, "I don't know." It's been go-go-go since that day and I really haven't had time to just sit back and soak it all in. I like it that way. I get bored far too easily and need something to keep me occupied. We arrived quite a bit later than we had planned at Steve and Julie's house in Calgary. We'd already missed dinner but that wasn't going to keep us from getting some grub. Not if Julie had anything to do with it... In very short order she had a wonderful meal spread out before us and we were stuffing our gullets with mighty fine fixin's. After finishing the latest entry into the Travelogue and posting our latest tracks it was time to turn in for the night. Bright and early (for us) the next morning we were on the road again headed west. The wind hadn't a chance to pick up yet so we were both in good spirits as we reached Banff National Park just west of Canmore, Alberta. 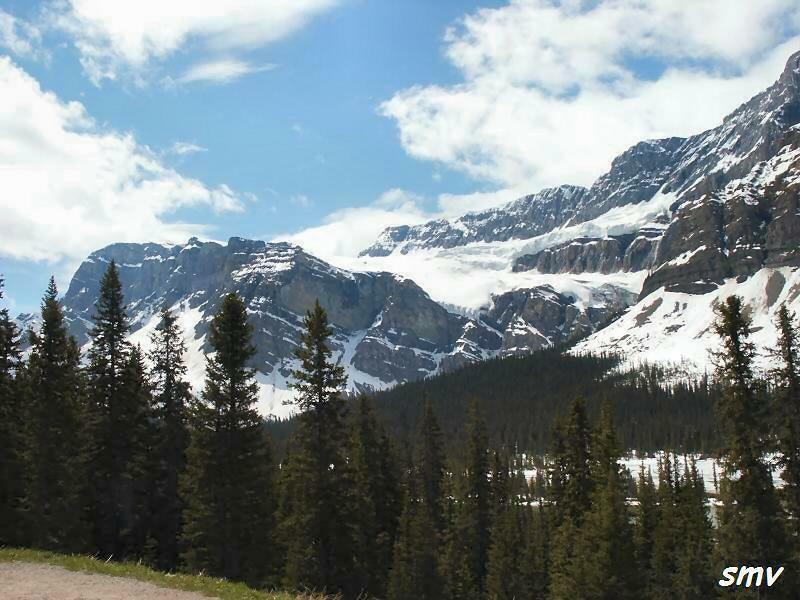 Banff is Canada's cohort to The United States' Glacier National Park. I will not be so bold as to compare one to the other. Suffice it to say I was quite happy being there. Tamara even allowed herself to admit that she was impressed. After our ride from Sweetwater, Montana to Calgary she really wasn't looking forward to much more flat and windy. Since neither one of us thought to charge the batteries for the camera before we left Calgary we didn't get much in the way of pictures. About the only one that turned out is this one of Crow's Feet Glacier. Looks like we'll have to go back again some time. Our planned return trip doesn't take us back through that way but you never know what might happen. On our way through the park we saw several samples of the wildlife that inhabits the park. There were Bighorn Sheep grazing alongside the road. There was a small black bear grazing alongside the road. There were elk grazing alongside the road. There were caribou and deer grazing alongside the road... Got me to wondering what was so wonderful about the grass growing alongside the road. Might have to stop and sample it the next time we go through. Pretty soon we left Banff and entered Jasper National Park. We couldn't have asked for better weather as we traipsed our way through the parks. It was cool, but not so cold as to require electrics. I wasn't even sporting the liners in my First Gear gear. Near the end of the trip it got a bit dicey. It started to rain a little bit. The rain wasn't the problem... The problem was that we were covered with dark clouds spitting rain but ahead of us, directly ahead of us, was bright sunny weather. Those factors combined together in such a manner that made it impossible for me to see anything other than the road's surface. After having seen eleventy-billion deer earlier in the day, it made for a tense 45 minutes or so. Knowing those deer were there, just out of sight and waiting to jump out in front of us was not a comfortable experience. It was even worse than riding through deer country at night. At least at night you can improve the situation by turning on more lights and occasionally seeing their eyes reflecting back at you. Just as it started to rain even harder and break out with thunder we rolled up to the Ramada Inn in Prince George, British Columbia. After a nice soak in their heated pool and a wonderful dinner in the restaurant (I've found a French Onion soup that's better than mine!) we turned in for the night not knowing what cruel trick fate had in store for us the next day.